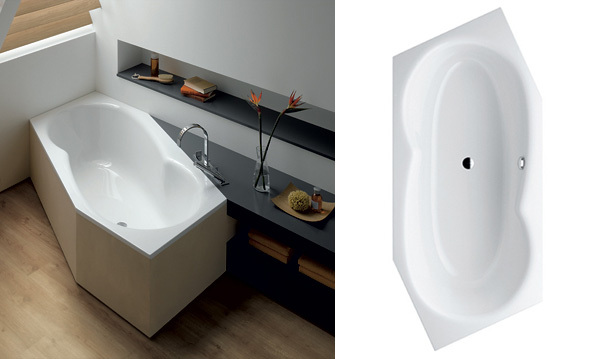 Duravit Blue Moon - Blue Moon by Duravit is a simple square body design with a circular tub inside. The colored lights and depth of the tub coupled with the mixture of materials make this tub simple and gorgeous. The wood option gives it an amazing, warm appearance. 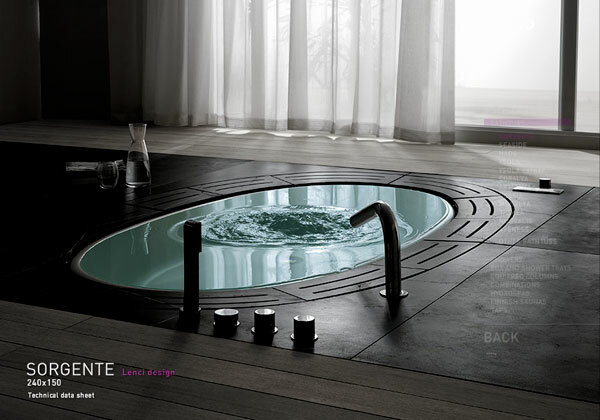 Teuco Sorgente - a stunning sunken bathtub that we couldn’t resist writing about on NOTCOT earlier. 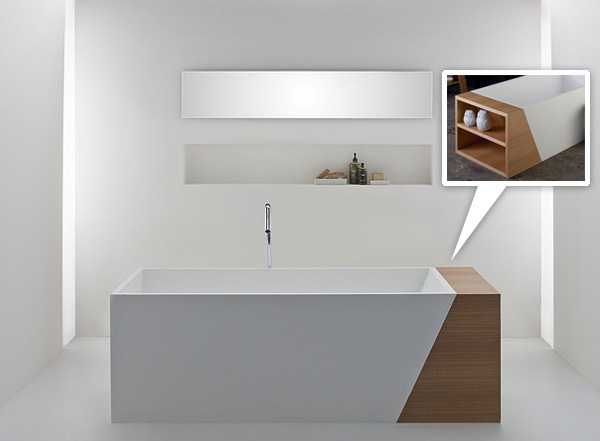 This one is fit for a bathtub room… best detail? The way the water fills to the very top since there’s a hidden overflow all around it! 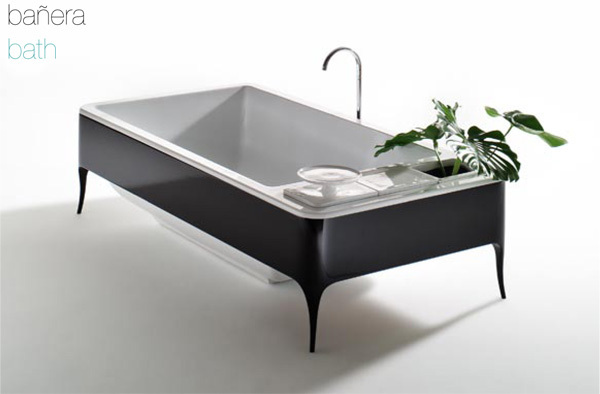 Agape Steel Tub by Patricia Urquiola - Beautiful black and white this steel/enamel tub contrasts so nicely with the wooden back and tray! 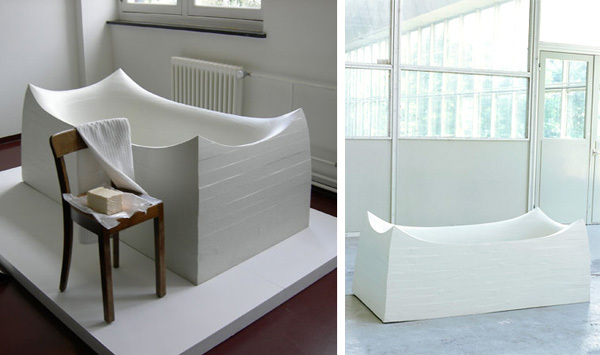 AQ Hayon Collection - I’ve been fascinated with this design (and the whole series) since 2006! 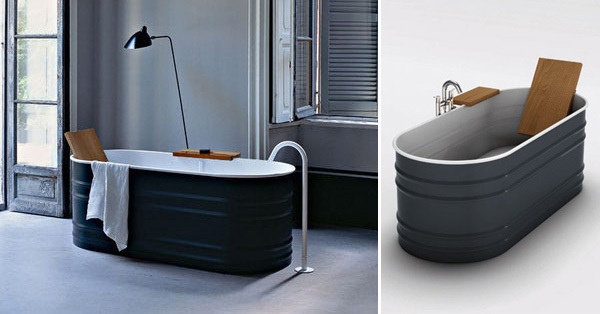 Amazing how something as clunky and massive as a tub can look so sleek and elegant. 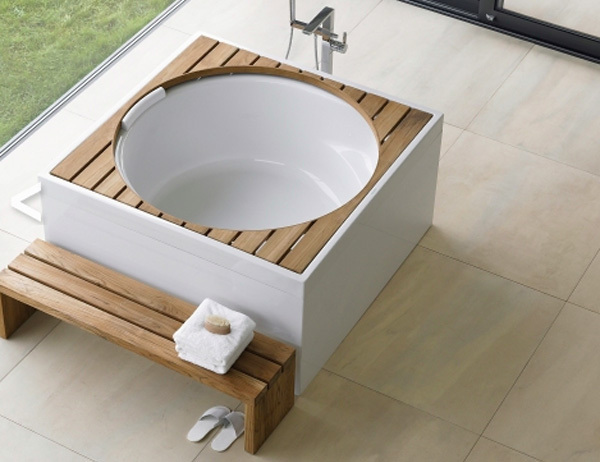 Omvivo Latis Bath with Timber Storage End - again with my favorite woody/porcelain combo… this one makes interesting use of the ergonomic slant to lean while bathing… and adds on a shelf on the outside! Schmiddem Bette Metric - love the geometric shape they use! 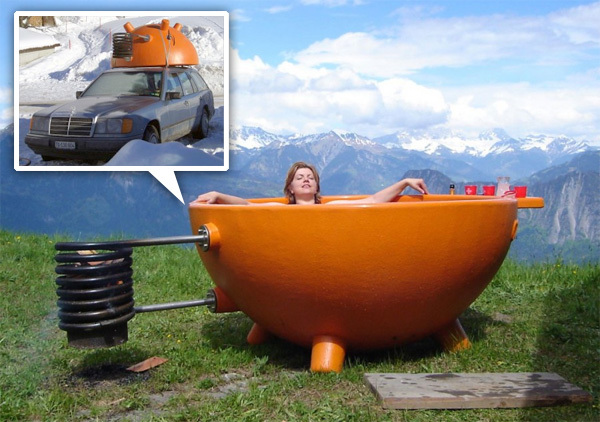 Dutchtub - This is practically a classic. I’ve wanted one for years and years… you burn wood to keep it warm… and you can even cook over the fire in a wok! Or toss it on your old mercedes and drive it through the snow. Or move it around your yard. Patio. Anywhere! 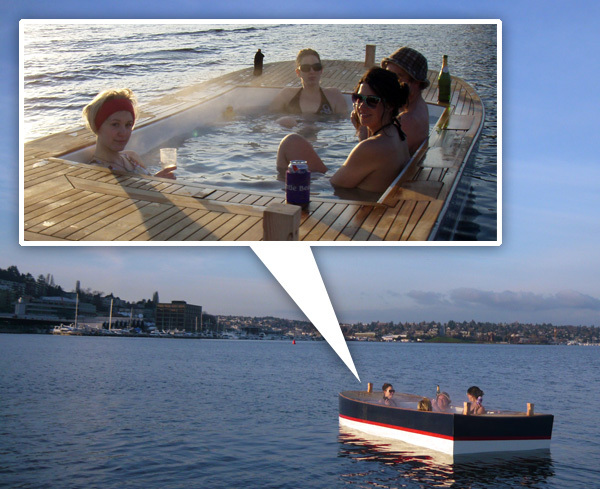 Hot Tub Boats - in seattle! You can hot tub boat around the lake… amazing. Hot Tub Boats are powered by an almost silent electric motor at approximately 4 knots. 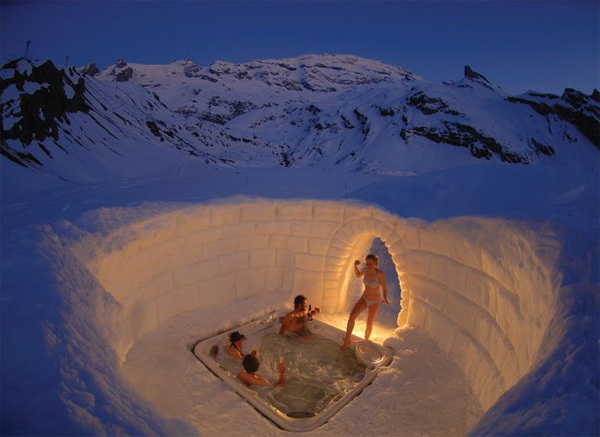 Iglu Dorf - This igloo village is rebuilt every season from 3000 tons of snow at seven locations in the Alps and the Pyrenees… and some include a hot tub! 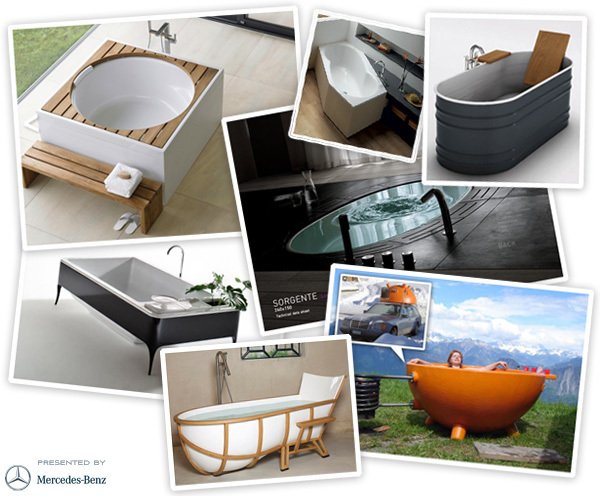 Not quite something to pop up at home… but a fun dream tub to soak in some day!